WCPMedia is a next-generation platform for storing, managing and sharing media content. WCPMedia allows users to manage content from post-production through distribution in a unified, highly secure environment. The combination of WCPMedia and Aspera results in a flexible and seamless solution that allows users to efficiently manage and share assets remotely with partners and clients around the world. 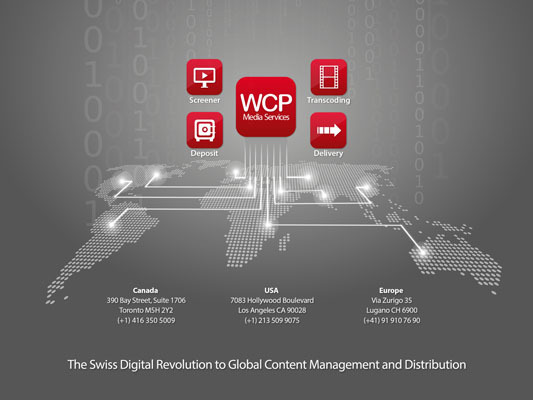 World Content Pole SA (aka WCPMedia Services) is an entertainment software and services company based in Switzerland, USA and Canada that manages, markets and distributes content to business partners and clients quickly, easily and securely. Aspera integration, enhanced Virtual Screening Room and much more. WCPMedia Services will demonstrate the latest enhancements to its revolutionary, B2B, cloud-based media management platform at IBC 2016, September 9-13, in Amsterdam. Improvements to the platform include the integration of Aspera high-speed file transfer, a new Uploader utility, additions to the platform’s Virtual Screening Room and a simplified user experience for third-party and occasional users. WCPMedia will be present at IBC in tandem with its technology partners Aspera, an IBM company, (7.G20) and Tiger Technology (7.K28). WCPMedia is a next-generation platform for storing, managing and sharing media content. The platform allows users to manage content from post-production through distribution in a unified, highly secure environment. It integrates leading-edge technologies for data storage and accessibility, file transfers, transcoding and content management, while remaining flexible and easy to use. Aspera Connect’s high-speed transport makes a perfect complement to WCPMedia’s robust digital asset management tools, providing means to quickly and securely transfer large media files and metadata. Content can be made available to recipient servers on either a push or pull basis, according to the application and user preferences. A new Uploader utility that allows users to transfer files to the WCP platform without accessing the full WCPMedia user interface. It provides a simple way for third party and or occasional users to upload content. Virtual Screening Room now offers greater flexibility to create catalogs and configure user access. Content owners can reach individual recipients by creating different and targeted catalogs ranging from dailies, selected scenes and rough cuts during post production, to trailers, promotional material and finished content during the sales and distribution process. FFmpeg transcoding engine has been added to existing Snell, Telestream and Harmonic software for even greater flexibility in transcoding. Integration of Tiger Technology’s shared storage technology for unprecedented speed in access to assets. Improved metadata compatibility to allow the automatic import of IMDB data. Redesigned and optimized landing and applications pages for a streamlined and intuitive user experience for occasional recipients. WCPMedia Services is employed worldwide by diverse media enterprises including studios, distribution companies, broadcasters, independent producers, production companies, film festivals and others. The platform was recently used by Wildside during production on Paolo Sorrentino’s “The Young Pope” to share dailies, selected scenes and rough cuts, and to deliver trailers to target buyers, and by the Federation Internationale Cinema Television Sportifs (FICTS) to manage content for “Sports Memories: Rio 2016”, a traveling sports media exposition associated with the Olympic Games in Rio de Janeiro. Founded in 2011 in Switzerland, World Content Pole SA (aka WCPMedia Services) is an entertainment software and services company based in Switzerland, USA and Canada that manages, markets and distributes content to business partners and clients quickly, easily and securely. 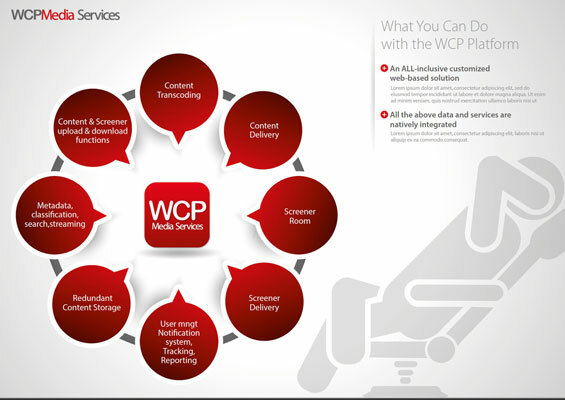 WCPMedia Services offers a platform of smart process applications that combines proprietary software with top-tier solutions developed by proven and trusted technology companies.